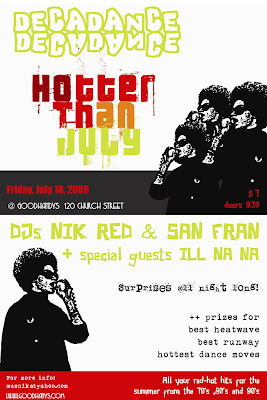 On Friday, July 18, 2008, we're mixing it up, spinning all your hot hits for the summertime from the 70's, 80's and 90's. We have so much great music that we couldn't limit things to just one decade this time!! We're encouraging everyone to dress up in their favourite summertime outfits: get out those short shorts and tube tops! DECADANCE : HOTTER THAN JULY! and Surprises all night long! Be prepared to sweat and feel the heat!! Style of Dress : Summer Fresh to Campiness Best! Prizes for : Best Runway, Best dress, Hottest summer Dance!